Right after the French Revolution, a lot of people in France were wondering, what sort of government did they really want? People wanted democracy, but on the other hand they were tired of the Revolution killing so many people and not getting much done. A young general, Napoleon, took advantage of the uncertainty to get control of the army. Napoleon was a good general and had won battles against Britain and Austria. A lot of people in France thought Napoleon was really cool, and many other people were afraid of him because when French people rioted in the street, Napoleon ordered his soldiers to shoot them all dead. After winning many battles against Austria and Italy, Napoleon decided to try to conquer the world, like Charlemagne or Alexander the Great. Fighting a lot of wars would keep his soldiers busy and happy. Winning a lot of battles would make Napoleon even more popular in France. And, conquering a lot of land would let France collect a lot of tax money. France was very poor at this time and needed a lot of money. So Napoleon fought more battles in Italy, and then won a big war against Austria. He sent lots of money from Austria and Prussia back to France. Next, in 1798, Napoleon conquered Egypt from the Ottomans, trying to find a way to fight the British in India – but the British and the Ottomans fought him off in the end. In 1799, Napoleon went back to France. He was very popular there now! He used the army to take control of the government of France. Napoleon, like Catherine the Great in Russia a little earlier, wanted to make his country more united. He insisted that everyone in France should speak French. Every man would serve in the army for a while. Every child would go to school, and all French schools would teach the same things. The other countries of Europe thought Napoleon and France were getting too powerful. Britain, Russia, Austria and Sweden agreed to fight together against Napoleon. Napoleon raised money by selling all the French land in North America to the United States. Once again Napoleon fought his enemies and won. 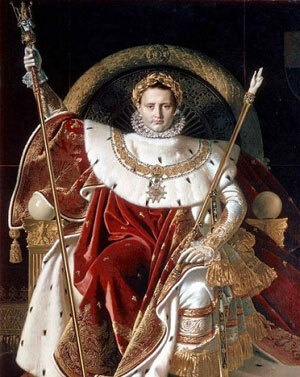 He got so popular in France that in 1804 he made himself Emperor of France. But the British and the Russians began to stand against Napoleon again. In 1803, the British (and yellow fever) forced Napoleon to give up control of Haiti. 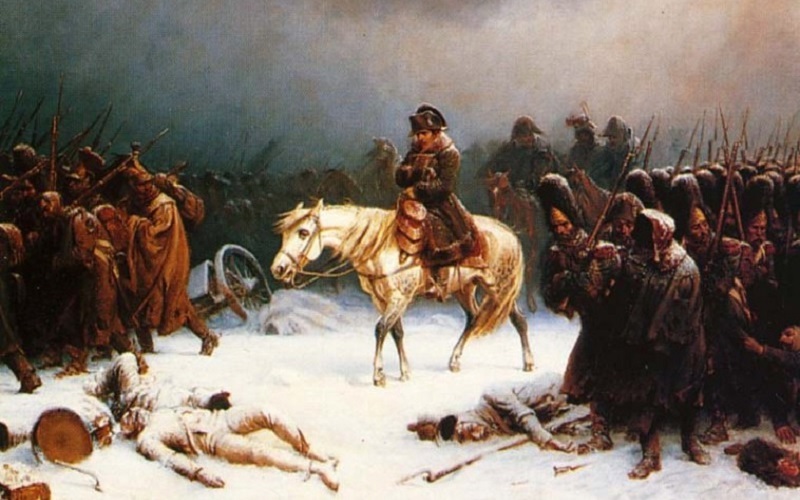 In 1812, Napoleon invaded Russia to stop them, but he lost his battles in Russia, and then most of his soldiers died of cold, hunger, and typhus when he was trying to get them back to France. Only one out of every 25 soldiers made it out of Russia. After the Russian disaster, Napoleon wasn’t so popular anymore. His empire fell apart. Austria and Prussia joined with Britain and Russia against France. In 1814, these enemies captured the French capital city, Paris, and Napoleon had to abdicate (quit). The winners sent Napoleon to live almost alone on an island, but later that year he escaped and tried to get back into power. He was still popular enough to get an army together, but he only fought one big battle against the British at Waterloo in Belgium – and he lost the battle. Napoleon was sent back to another island, and this time he stayed there until he died of stomach cancer six years later. Cite this page: Carr, K.E. Napoleon – European History. Quatr.us Study Guides, August 5, 2017. Web. April 23, 2019.